This is the best crossover for you if you want an all-new seven-passenger premium-class SUV at a price that undercuts fellow German-brand rivals. The ’17 Q7 is fully redesigned and introduces styling themes that will spread throughout the Audi line in the coming years. It’s cutting-edge interior design is particularly striking. This is the second-generation follow-up to the 2006 original Q7. It’s nearly the same in all dimensions, but is up to 500 pounds lighter, thanks to more aluminum-intensive construction and advances in engineering. That translates to faster acceleration and better fuel economy, benefits that its all-new structure will share with other vehicles from parent-company Volkswagen and its Bentley and Porsche brands. Audi’s planning an innovative diesel model for overseas markets and is reportedly considering a plug-in hybrid variant. Neither, however, is confirmed for the U.S., so don’t expect the ’18 Q7 to change enough to wait for. It’ll almost certainly cost more than the ’17, though. If you like the ’17, you’ll choose from base Premium, midlevel Premium Plus, and flagship Prestige trim levels. All are powered by a supercharged V-6 engine and Audi’s quattro all-wheel drive. A high-performance SQ7 variant is in the works, which would be powered by a turbodiesel V-8. It is expected to hit the market after getting the green light from both the company’s board of directors and US Environmental Protection Agency. Sales of diesel-engine VW Group vehicles, including Volkswagen, Audi, and Porsche, have been under a moratorium since late 2015 because the company was caught cheating on emissions tests. The 2017 Q7 kicks off a new design language for Audi, with a hexagonal grille flanked by short headlights and sharper creases along the body. It contributes to a look that makes the vehicle seem smaller than it really is and is a refreshing update from the rather bulbous outgoing model. Passenger room and comfort in the first two seating rooms are quite good. Accessing the third row requires folding and flipping the second row seat forward in a manner that is not as elegant as that in the Acura MDX or Infiniti QX60. Third-row seating is very cramped, so you’ll want to save it for toddler and/or short trips. Q7’s cargo capacity of 71.6 cubic feet with the rear seats folded is near the bottom of the competitive set. 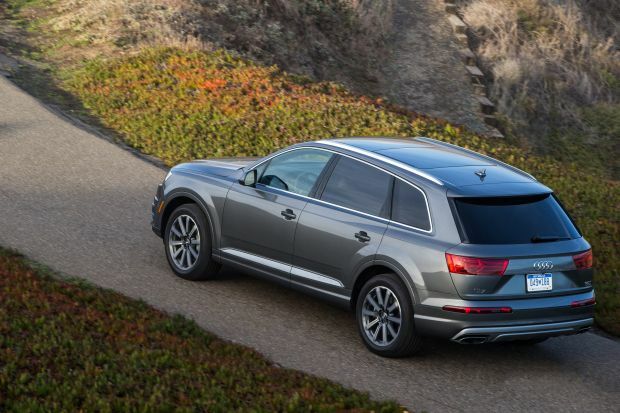 All Q7 models use a 3.0-liter supercharged V-6 engine with 333 horsepower and 325 pound-feet of torque, mated to an 8-speed automatic transmission. Audi says 0-60-mph acceleration takes 5.7 seconds, but based on our seat-of-the-pants impression, it doesn’t feel quite that quick. Bear in mind the Q7 still weighs almost 5,000 pounds, but every little bit helps. This SUV lends its basic design to Audi’s premium-compact A4 sedan, and it will also underpin the upcoming Q5 premium-compact crossover. Handling is competent, but Q7 doesn’t quite match the sporty moves of the BMW X5, or even the Acura MDX. This is mostly due to suspension composure. Set the available Audi Drive Select to Comfort, and Q7 pitches and wallows over bumps. The Auto mode tightens it up and is going to be the ideal choice for 99% of driving situations. Sport mode enhances handling, but makes the ride too brittle. Even Premium models come with a tempting array of features, including leather upholstery, 8-way power heated front seats, xenon headlights with LED daytime running lights, a power panoramic sunroof, front- and rear-obstacle detection, forward-collision alert, and forward-emergency braking. Premium Plus models add keyless entry with pushbutton engine start, a hands-free power liftgate, navigation system with handwriting recognition, blind-spot and rear cross-traffic alert, and support for Apple CarPlay and Google Android Auto. The Prestige includes all that, plus four-zone automatic climate control, ventilated front seats, rear side window sun shades, a 19-speaker Bose-brand audio system, surround-view camera, head-up instrument display, and Audi Virtual Cockpit, which replaces the traditional gauge cluster with a 12.3-inch LCD display. While Audi’s MMI interface for controlling navigation, audio, and vehicle settings is much improved over previous versions, we’re not entirely sold on the virtual cockpit. Its display is crisp, but the wide range of configurations strikes us as more of gimmick than something that provides real value. A base-price range of $55,750-$65,250 undercuts comparable versions of such European rivals as the BMW X5, Mercedes-Benz GLS, and Range Rover and makes the ’17 Q7 less costly than even the Cadillac Escalade and Lexus LX570. The impressive new Volvo XC90 is one of its closest rivals on price, style, and interior décor. The Q7 Premium starts at $55,750, the Premium Plus at $59,750, and the Prestige at $65,250. All base prices include Audi’s $950 destination fee. On any l Q7, a paint color that is not basic black or white costs an extra $575-$1,075. Torso-protecting rear-side airbags are $350. Three different genuine wood inlays are available at no extra charge. For $1,000 on the Premium and Premium Plus, you can upgrade the standard 19-inch wheels to 20s. The same price will upgrade the Prestige’s 20-inch wheels to 21s. All models have run-flat tires. Most other factory options come in packages. All offer the $500 Cold Weather Package that includes heated rear seats and a heated steering wheel with gearshift paddles. A Towing Package that includes a trailer hitch is $550. The wiring to accept a dealer-installed rear DVD entertainment system is $150. A navigation system with Audi Connect telematics is $3,000 on the Premium. The Premium Plus is available with the $2,000 Vision Package, which adds full LED headlights, virtual cockpit, and surround-view camera. Four-zone climate control, ventilated front seats, and rear side window shades are part of the $1,600 Warm Weather Package. Available on the Premium Plus and Prestige is the $2,400 Driver Assistance Package, which includes traffic sign recognition, adaptive high-beam headlights, and full-speed adaptive cruise control. At about $65,000, a Premium Plus with the Warm Weather and Driver Assistance packages is the best buy of the Q7 line. It undercuts comparable BMW X5 and Mercedes-Benz GLS-Class models by several thousand dollars. Prestige-exclusive options include a $4,000 adaptive air suspension and the $6,000 Luxury Package. The latter includes Valcona-brand leather upholstery, 18-way power front seats, soft-close doors, and an Alcantara-brand faux-suede headliner. A Bang & Olufsen audio system is $5,000, and a night-vision camera is $2,500. 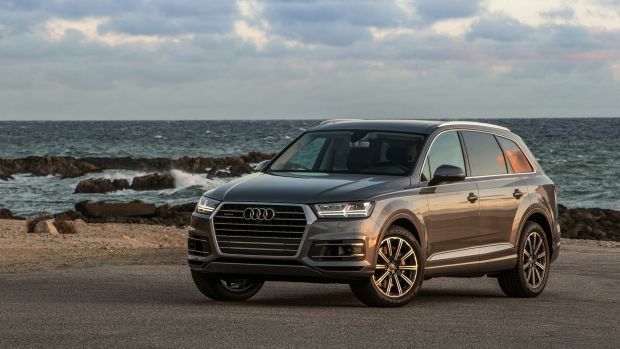 Audi’s weight-cutting and other efficiencies pay off in EPA ratings that beat every direct rival that isn’t a hybrid or a diesel – except versions of the Volvo XC90 with a four-cylinder engine that’s both turbocharged and supercharged. The 2017 Q7 rates19/25/21 mpg city/highway/combined. By comparison, the four-cylinder SC90 rates 20/25/22. Audi requires 91-octane premium-grade gasoline for the Q7. What’s next for the Q7? If it gets the green light for export, the high-performance SQ7 will be an interesting addition to the product line. It’s powered by a 4.0-liter diesel V-8 engine that makes 435 horsepower and a massive 664 pound-feet of torque. The motor employs two turbochargers and an electrically powered supercharger. The supercharger is powered by a 48-volt lithium-ion battery rather than the engine’s crankshaft. It delivers instantaneous response, minimizing the possibility of lag when the turbochargers kick in. Audi says the vehicle will run from 0-62 mph (0-100 km/h) in 4.8 seconds and reach a top speed of 155 mph. Europeans will have their chance to purchase the SQ7 by summer 2016. Hopefully buyers statewide will, too.